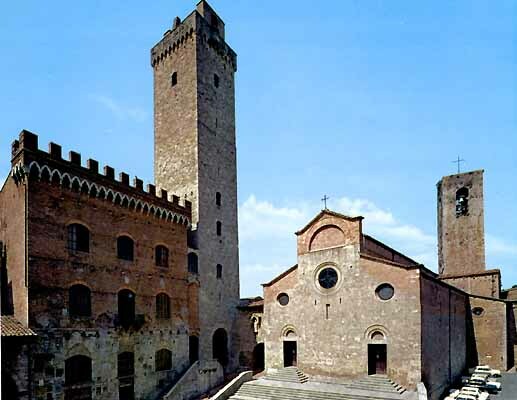 San Gimignano is a little medieval town in Tuscany. It had been a stop along the pilgrim's path to the Holy Lands, until the plague hit. Now a days, it's not quite as touristy as some other places we went to, but we were there on an Italian national holiday, so it was quite crowded. The first thing we did was go to the Doumo, above. 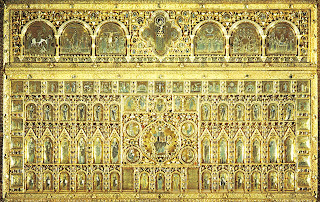 We weren't allowed to take pictures inside the Doumo, so I pulled this off the Internet. The walls were covered in these amazing frescoes. One side was all Old Testament stories and the other side was all New Testament stories. The Hell fresco was in the back of the church, and was pretty disturbing. And for whatever reason, they had a lot of postcards depicting scenes from the Hell fresco. My favorite thing about this church was all the fake marble. Either they couldn't afford real marble, or obtain real marble, and thus painted panels below the story frescoes to look like marble. We saw this technique in a few other places in Italy, but San Gimignano had the best fake marble. After a quick picnic lunch, we climbed to the top of the bell tower. It was a lot of steep, steep stairs, ending in a little metal ladder to get all the way up to the top. But the views were worth it. I loved this tower with flowers growing out of the side of it. We ate the best gellato I've ever had in my life and then wandered around the town a little bit before heading off for a tour and dinner at Fattoria Poggio Alloro, a small family run organic farm and winery. This is a view of San Gimignano from the farm. We saw the vineyard and the winery. We then sat down to one of the most amazing meals of the whole trip, which included beef from the cows we had just seen. Every part of the meal was organic and produced there at the farm. It was seriously delicious. After our first quick Italian lesson, we had a nice free day to chill out, relax and just enjoy the country side after all the hub bub of Venice. We hiked up behind Fattoria Bassetto, part way to Certaldo Alto, seen in the above photo. It was hot, but the scenery was just beautiful, looking just like something out of an Italian movie. The olive trees were just starting to bloom. And these red poppies were everywhere! We took the lift up into Certaldo Alto, where we toured the little place there and a couple small churches. We saw some more modern art on display in palace, and the body of a Saint Julia. We also saw this spectacular view of Certaldo, from Certaldo Alto. That evening we visited La Meridiana, a cermics school and had a pizza party there with some students from another North Carolina university, of all places. We took the train to Certaldo, a sleepy little town in the middle of Tuscany. This is the door to our hostel, Fattoria Bassetto, which used to be a monastery. These were the stairs just inside that door. I love these stairs. They were so worn from so many years of monks. I don't have a picture of it, but my favorite was the stone thresh hold between the kitchen and the hallway. It was smooth, dark gray stone that had a definite dip in the middle. Just to think of that piece of stone being worn smooth by the leather sandals of the monks gives me chills. This is the outside of the building where we slept. The villa, where my professors and some other guests stayed. The grounds of Fattoria Bassetto were just beautiful. My absolute favorite thing about the grounds were the lizards. They were everywhere! Some were skinks, like this one and some were geckos. They were super fast, and difficult to photograph. I kept a tally in my sketchbook of how many I saw here and I was up to 26 by the time we left a few days later. That evening we went up to Certaldo Alto for drinks and dinner. Certaldo Alto is a little medieval town, on the hill above Certaldo proper. Duiglad, the Australian that takes care of the running and up keep of Fattoria Bassetto, took us all to the little bar where his friends work. This Irish man, another friend of Duiglad's, serenaded us with his guitar. After we hung out there for a little while, we went to dinner with this spectacular view of Tuscany. A couple of my friends participated in UGA's Cortona program when they were in undergrad and had told my friends that were going on this trip and me about stumbling upon this graffiti of a guy saying "Don't Touch My Radio." All we really knew was that it was somewhere in Venice, and low and behold we were wandering around one night, turned a corner and there it was! Ever since I got interested in glass in high school, I've been fascinated by Murano, the Venetian island known for centuries for glass making. I've had this image of what I thought it would be like in my head for years. And of course, whenever you build something up like that, you're bound for disappointment. To be fair though, Linda warned me. I was expecting heat and grit and gaffers who were jovial, but secretive, guarding centuries of family knowledge. What I got was slash and glass. Everything looked the same. I watched one of the most lack luster glass blowing demos ever, given by one of the most joyless makers I've ever seen. It was sad, like watching an animal in the zoo. I saw more spectacular work being done at the hot shop and Kent State. I saw the signs for furnaces everywhere, but the only actual furnace I saw was where we went to the free demo. It made me wonder if these furnaces were just closed to the public, or closed for good. Everything else was shops full of glass for tourists to buy. Some of it was cool. Most of it looked the same. As I said before I did buy a little glass. I snuck a studio shot of the one store where I bought my murini, and that made me feel a little better. We did see two large scale contemporary glass sculptures, also. We wandered around for a while, looking for the ferry to take us to Burano, and in the process found this little area down by the water where the boats wash up all sorts a pebbles and bits of glass that have been thrown into the canal. We spent quite a while there, picking through it, collecting bits we liked. Bob would have been so proud. We finally found the right boat and hopped on over to Burano, the lace making island. Burano was way cooler than Murano, but unfortunately we were running out of time and didn't stay there long. All of this lace in hand made. There was so much of it, and it was simply stunning. I regret not buying just a little something from here. The houses were all painted these crazy parti colors and the whole town/island had kind of a beach town vibe. It felt a little less touristy than the other parts of Venice we were in. After Burano, we watched a short film on the history of Venice, hung out in San Marco Piazza, where we watched this beautiful Italian couple make out for 15 minutes, went to dinner and went back to the hostel to pack for the next morning's departure for Certaldo. We started out in Venice. This was the view from our hostel window. Pretty spectacular, right? If you wanted to get anywhere in Venice you got on one of the ferry boats. I didn't realize that Venice is actually a series of islands. I also didn't realize that it's was built in the middle of a swamp. People settled there to avoid marauders and sunk timbers down into the peat, which petrified over time. They then put planks and stone over the timbers and proceeded to build their city from there. There is no bed rock in Venice. I felt off the entire time I was there and I'm pretty sure it's because there wasn't any bed rock. This is a shot of the Palace of the Doge. The Doges ruled Venice and their palace is next to San Marco Basilica, built for St. Mark, otherwise known as Mark the Evangelist, who wrote the second gospel of the New Testament. 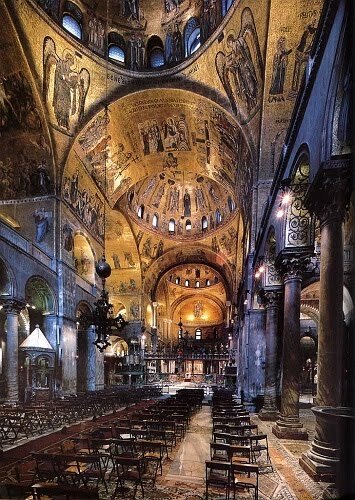 San Marco Basilica is stunning. 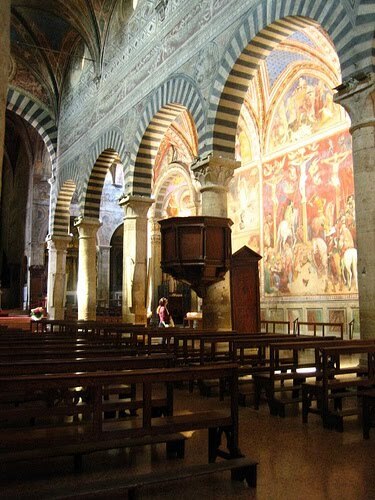 The interior is covered with mosaics that took over 400 years to complete. 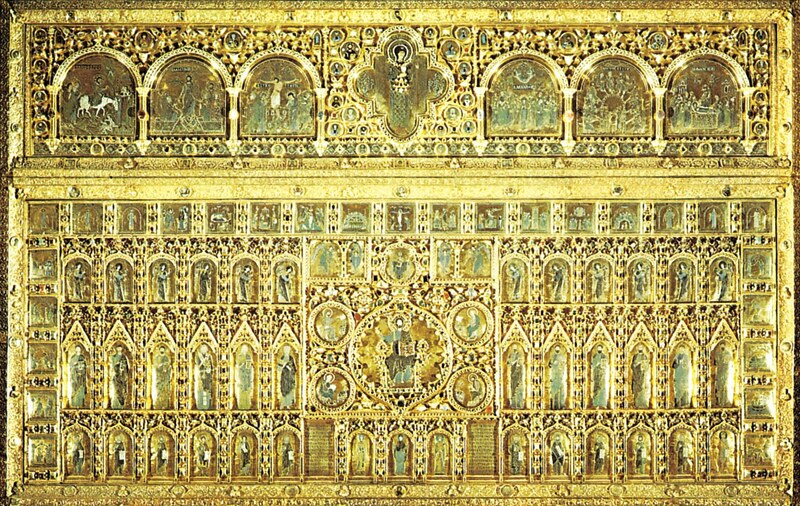 The tiles are glass from Murano, most of which are covered in gold foil. The skin tones are made with stone. This mosaic is on the outside of the church, so I was able to get a picture. (Pictures inside were prohibited.) It illustrates how the bones of St. Mark were smuggled into Venice in pork. Two merchants STOLE THE BONES OF ST. MARK from his death place in Alexandria and brought them to rest in Venice. Most of the exterior of the basilica was also stolen when Venice conquered Constantinople in the Crusades. Here's a Google image of the interior. They turn the lights on only for one hour everyday. Fortunately, we were there to see it. We also got to go behind the alter and see this HUGE gold and enamel piece. The enamels are all opaque, the basic shapes of the figures are engraved and then the line work is added using gold cloisonne wire. It's also covered in gems and pearls that are attached in just about anyway they could be. I don't really know what else to say about this piece. It blew my mind. There aren't really adequate words to describe it. There aren't really adequate words to describe San Marco's Basilica. It was one of my favorite things we did the whole trip, but I don't really know what else to say about it. It was so moving in one of those nearly transcendent, indescribable ways. We also went to the Acadamia in Venice, (not to be confused with the Acadamia in Florence). We saw some really great Byzantine art and some great paintings of Venice. We bought some wine and some Italian snacks and hung out in the common room at the hostel with a guy from Scotland and two girls from Canada, which was a lot of fun. Then dinner and a nice long wander through the city, where we got just the right amount lost. I'm going to cut right to what I'm sure you're all just dying to know. What I brought home from Italy. I know it doesn't look like much, but let me tell you, it sure felt like a lot of rocks when I was lugging my suitcase around. I also put all this stuff in one of the front pockets of my suitcase, which caused it to not stand up on it's own anymore. The tan rocks are from Tuscany and the smooth gray ones are from the beach in Cinqueterra. Some of the smaller stuff to the left is from Murano and includes some glass chips. I did buy some glass on the island of Murano even though it all looked the same and it all looked exactly like what you find in the states. Sorry to sound cynical, but Murano kind of broke my heart a little. The little bag is full of murini, which I'm going to use in my enameling. I found a rock shop in San Gimignano where I bought the black tourmaline and the three araonites. I seriously love me some aragonite. The four smaller stones were given to me by a jeweler in Castalina in Tuscany. He had a bunch of damaged stones that he couldn't use and when he found out a few of us were jewelry students, he gave each of us a few. Super score, we found a flea market in Florence! All the same kinds of stuff I look for here in the states, only in Italian and way cooler. Boxes of vintage postcards, lace, little cards of the saints, old photos and letters. It would have taken all afternoon to go through it all. I got postcards, saints, lace, a small scoop, a lace weaving bobbin, and a small jar. When in Florence, buy scarves. Seriously, I think everyone in the group came home with at least one. Also, when you're me, of course you buy books. The Alchimia book was given to me when we visited the school and I bought the "I Journey With You Here" book because that tiny exhibition was one of my absolute favorite things I saw the whole trip. I'm not Catholic, but some of my family is and I've always been kind of fascinated with rosaries and the Saints. So, of course more books, a rosary that came with a small booklet that explained the praying of the rosary, and a nicer rosary from the Vatican (blessed by the Pope!). The little Virgin Mary is made of tin and the black book is on the Scientific Instrument collection at the Bargello. It's in Italian, but the images are good. Some go to Italy for the high fashion, some go for leather, some go for fabulous shoes. I, of course, went for the paper. Some of this is from Florence and some from Rome. I bought a lot of paper stuff. And, or course, I bought a TON of postcards. I even managed to mail off a few, which made me pretty proud of myself. In many of the churches and museums, you weren't allowed to take photos, so postcards were a great alternative. Although, it's my personal opinion that if an institution isn't going to allow photos, it should have a postcard available of every piece in its collection. Really, I don't think this is too much to ask. Also, museums shoudn't have postcards of pieces they don't actually have in their collection. I also bought a dress from the Street Market in Florence, some excellent food and snacks, bad lemoncello, slightly better lemoncello, and a few little things to stick in my sketchbook. My best deal was 20 postcards for one euro in Rome. Overall, I'm pretty pleased with my purchases and finds. Although I wish I would have had room for more rocks. Whew! I'm back from Italy with TONS to blog about. I don't feel jet lagged at all, which is great, but I am a little disoriented. It's kind of surreal being back in the states, especially since I only have two days back in Greenville, before I have to get BACK on a plane and take off for my hometown in Pennsylvania. I wasn't really sure what to do with myself, but laundry seemed like a good place to start. An Itinerary also seems like a good place to start. Partially to help me keep organized in my mind what we did on what days. Don't worry, I go into more details in furture posts. June 4: Tour through Chianti region, visit to blacksmith's studio, visited the little town of Castalina, went to a fascinating jewelry shop there, wine tasting at a small family farm, Comedia del Arte performance, dinner at hostel cooked by Italian boys, magic tricks during dinner by the Comedia del Arte performers. June 15: up at 6am Rome time, airport by 7:30, boarded the plane at about 10am, spent 10 HOURS on a plane, customs and connecting flight in New York, short plane to Raliegh, dinner out including fried chicken and french fries, drive home to Greenville, walked into my 92 degree apartment at 10 pm Eastern Standard time. I'm back in the states! Did you miss me?